The thaw finally arrived yesterday. Today has been a clear blue-sky day with the temperature a few degrees above freezing. Only a few stretches of ice remain on the riverside path. The Keyworth Turkey Trot half marathon is tomorrow, and the race website reports that the roads are now clear. So the race is on. At the moment the temperature has fallen below freezing again. The Met Office is forecasting a northerly breeze with temperatures a little lower than today, for tomorrow. So it will be cool, but not too cold for running. In light of my troubled year, largely dominated by the episode of acute arthritis in February, and lingering knee problems that persisted until October, I will be relying on a seven week training program that has gone reasonably well despite starting from a very low base level of fitness, though the interval sessions have been disappointing. The icy conditions in the last two weeks have confounded my plan to make the final adjustment of my target pace in light of the pace I could maintain in a tempo run. So I have reviewed the overall program to allow me to make some estimate of target pace. The major goal of the program was to avoid injury or illness while training regularly. Because I have an interesting but demanding job that entails working long hours, it was essential to coordinate my training load with work stress. My plan was largely shaped by the fact that end of my working week is usually more stressful than the beginning. I therefore planned that I would do my most demanding session on Saturday, together with a low intensity but moderate volume session on Sunday and a moderate or high intensity session on Wednesday. On the other days I would do either ran easy recovery run or an elliptical cross training session. The volume and structure has borne some resemblance to the Furman program, but in light of my fragile base, I made no attempt to achieve the intensities recommended by Furman. 6 Long runs ranging from 16 to 26 Km in length (mostly in low aerobic zone but including several progressive runs in which I gradually increased pace from low aerobic to upper aerobic zone). 6 moderate or high intensity running sessions (2 intervals sessions, 2 fartlek sessions, 1 long hill repeat session and 1 tempo run in the snow). I ran an average of 37 Km per week with peak of 45 Km per week. The total time spent training, including the elliptical sessions, was 42 hours. Over half of the training (25 hours) was in the low aerobic zone, at HR<120 (i.e. below the first ventilatory threshold). I recorded my Heart Rate Variability during a two minute period of standing quietly, each morning, to monitor my stress levels. Decreasingly levels of high frequency variability indicate stress. The quantity that I measure in the natural log of a quantity known as RMSSD, which provides a suitable measure of high frequency variability. A clear pattern emerged, as shown in figure 1. Following the most demaning session HRV decreased and continued to decrease until Tuesday, suggesting that my body was taking about two days to recover from the exertion of the weekend. Then it increased on Wednesday and still remained high on Thursday morning despite the moderately intense (but usually short) session on Wednesday. However by Friday morning it had plummeted to the lowest value for the week. This almost certainly reflected the combined effect of the moderately intense mid-week training and work stress in the latter half of the week. However, usually by Saturday morning, following a good night of sleep on Friday, it was back to near its maximum for the week. 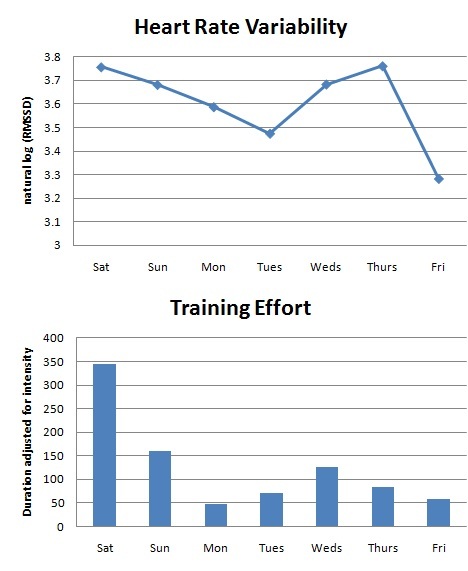 Figure 1 also shows the weekly pattern of training effort. I estimate training effort by adjusting the number of minutes spent training to allow for intensity. For example, time spent near lactate threshold is multiplied by a factor of four relative to very low intensity running and time in the anaerobic zone is multiplied by a factor of five. The figure confirms that HRV falls for about two days after effortful training, while the combination of effortful training and work stress produces the most dramatic drop. I was prepared to decrease the training effort if the HRV record demonstrated that I was not recovering adequately by Saturday morning. There were two Saturdays on which a relatively poor HRV record raised the possibility that I should take things easily. On both of those days I set out on my long run cautiously, prepared to curtail the session if necessary, but on each occasion I felt good once I had warmed up thoroughly, so I completed the planned long run. 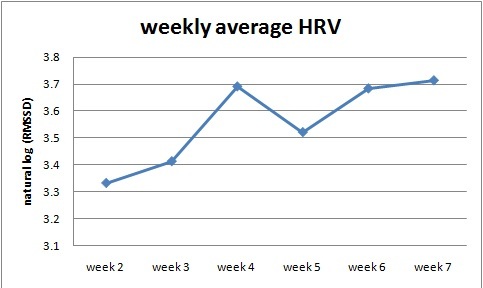 Figure 2 shows the HRV data over the seven week period, averaged across the days within each week. It is noteworthy that there has been a fairly consistent upward trend, indicating increased fitness. An increasing trend over time can only be interpreted as an increase in fitness if the average training load remains approximately constant, as an increase in load would be expected to increase stress and therefore produce a decrease in HRV while a decrease in training load will have the opposite effect. The anomalously high value in week three reflects the fact that I decreased the intensity of training markedly that week at a time when I was increasing total volume. The data indicates that I have grown fitter, though of course the total amount of training has been very modest. In the interval sessions I have struggled to achieve times any faster than 4:45 during one Km repeats. In my progressive long runs I have managed to cover the final 5Km in times ranging from 25:10 to 25:50, and in my one tempo run (in snow) I covered 5Km in 25:50. Overall, this suggests that I would struggle to maintain a pace of 5 min/Km for the entre half marathon distance (to give a finishing time of 105:30). Furthermore, the course is hilly and is described by the organizers as ‘challenging.’ Thus I can only realistically expect to achieve a time around 110 minutes. However, I have already achieved my major goal of training regularly for 6-7 weeks without illness or injury. My knee feels far better now than it did at the beginning of the program. Therefore, provided I avoid injury tomorrow, I have nothing to lose by pushing myself to them limit of my fitness. I will therefore start at a pace around 5 min/km and adjust it as necessary according to how I feel. This entry was posted on December 11, 2010 at 11:47 pm and is filed under Training. You can follow any responses to this entry through the RSS 2.0 feed. You can leave a response, or trackback from your own site.